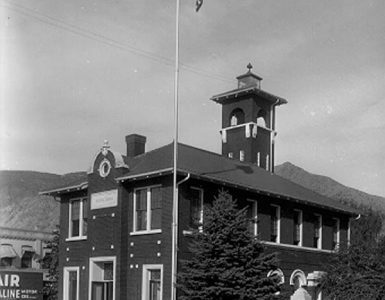 Brigham City’s early interest and success in community dramatics declined when the local troupe lost its home in the upstairs of the County Courthouse in 1889. Although sporadic productions were staged in the upstairs of Rosenbaum Hall, in LDS wards, and in Factory Hall (the woolen mill), the lack of a proper place to store props and costumes dampened the ardor of the players, as well as offering less comfortable seating for audiences. In addition, the popularity of traveling troupes with famous names offered heavy competition to local amateur players.1Sarah Yates, “Opera House, Theatres Were Part of History,” Box Elder Journal, Brigham City, UT, April 15, 1976, 9. It was with these traveling troupes in mind that, in late 1890, a group of local businessmen decided to purchase the old Social Hall, on the northeast corner of the intersection of Forest and First West, and renovate it into an opera house. This building was erected circa 1876 for use as the Co-op mercantile store downstairs and a social hall upstairs but was closed when the three-story mercantile building on the corner of Main and Forest was completed. 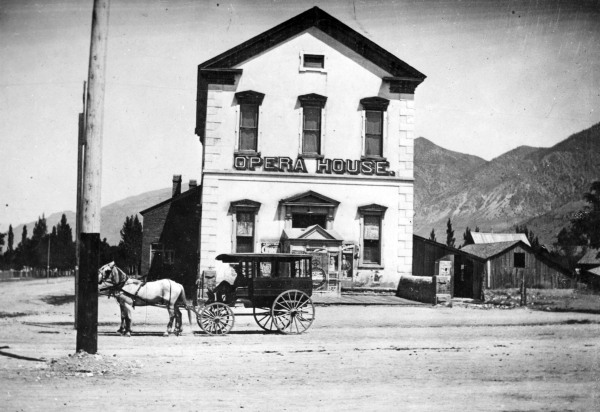 With hopes of taking opening night honors, the Brigham City Dramatic Association reorganized in 1891 for the purpose of producing a play in the new Opera House. Mansfield L. Snow, the editor of the new Brigham Bugler, was a backer of home dramatics and the opera house project. He made certain the readers were excited about the project by printing a running account of the construction and renovation of the old social hall. On the front page, he reported the arrival of bricks for the front extension, the construction of a gas plant to provide illumination, a hot air furnace, the progress of the paper-hangers, and the arrival of the 550 chairs and scenery. The grand opening was first set for October 30, 1891, with this description of the Opera House published in the Bugler: “The building will comfortably seat 500 people, divided as follows: parquet, 350; circle, 150; back gallery, 100. The chairs used in the house are of an easy comfortable style, with shawl rack and hat holder.” 2“The New Opera House,” Brigham City Bugler, (Brigham City, UT) Oct. 30, 1981″ It was noted that the remodeling, including the “commodious ballroom” above, had cost the company between $15,000 and $20,000. 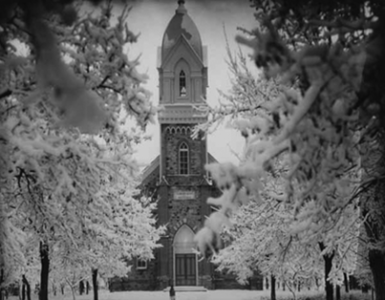 Leading businessmen Lorenzo Snow, Samuel Smith, A. E. Snow, Rudger Clawson, W. L. Watkins, Ricy H. Jones, and R. L. Fishburn, Jr., were officers in the company. At the same time the editor watched the construction, he was urging action on the part of the home dramatic troupe and wasn’t disappointed. They opened on November 6 under the direction of H. R. Bowring and E.A. Box, with “Kentucky, or the Broken Vow” as their first production. The opera house had conventional scenery with painted slats that slid into position in grooves. Special scenery was sometimes built by Amos Larsen. Most of the young ladies furnished their own dresses, but Frank Bowring and his father Henry Bowring had acquired many boxes of costumes through their years in show business. Refreshments were available as boys walked down the aisles with pitchers of water, pouring a glass and passing it down the row for anyone who wanted a sip. Upstairs in the ballroom was a fine maple dancing floor, which was used for community and church dances and parties. Dancing teachers rented the upstairs for instruction. 3Sarah Yates, “Opera House, Theatres Were Part of History,” 9. Home productions were cut short in early 1892 by disagreements between theatre manager A. E. Snow and the home dramatic club. The editor, his half-brother, printed information about the disagreement and urged new management. He was sued for libel, but the suit was unsuccessful. Management did change, but it was through mortgaging the building in June 1893, to the Rich family, which remained in ownership for many years, with John Y. Rich as manager.4Yates, 9. Even with traveling troupes, the theatre didn’t run completely smoothly. The newspaper remarked that “bawling babies and big bonnets – or hats – should be strictly prohibited from the New Opera House. An infant almost ruined two acts of last Saturday’s performance by its vociferous squeals.” The big bonnets became the subject of much correspondence to the local newspaper. Brigham City was not without home drama after the demise of the home dramatic club in 1892, for the LDS wards benefited by adding the amateur actors to their ranks. Touring companies increased their visits to the city from 1893-1905 to use the new Opera House, with some 40 companies appearing locally during each of the years.5Yates, 9. In 1898, Bishop Lorenzo Stohl of the Third Ward obtained ownership of the Opera House and it became the property of the four wards, eliminating the high rental fee which had helped to force amateur companies out of being. A new generation of Bowrings, Snows, and Bairds took an interest in drama and reorganized the Brigham City Dramatic Club. The arrival of elocution teachers Moses and L. L. Johnson of Provo also gave new impetus, since they taught through the production of plays by their students. John E. Baird, C. N. Christensen, and Frank Bowring were responsible for the new company formed on November 28, 1898.6 Yates, 9. Although the new company toured the county, they did not perform regularly, but on their own time. This made it easier to avoid direct competition with traveling companies and the new motion pictures, which would arrive early in the new century.